CCTV cameras are fast becoming one of the most popular security options we offer here at IDS. 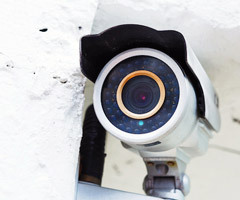 Surveillance cameras offer added security that allows you to monitor the premises of your property which deters crime, but also records video evidence if a crime is committed. This extra security measure gives you peace of mind that you are taking safety precautions that make your property extra secure. Some security companies will guide you through the buying process but leave your security system for you to install and maintain. At IDS, we are with you through the whole process - we will help you select the best security system to suit you, install it, and provide CCTV maintenance thereafter. CCTV maintenance is key to ensuring that your security system is performing it's best at all times. The last thing you want is to ignore CCTV maintenance and find out it wasn't working in the event of a crime. Like all technology, if you want it to work to the best of its ability, maintenance is key. We offer maintenance for all the CCTV systems we supply so if you are looking to have one installed, learn more about what we offer here. We use state-of-the-art surveillance technology including radio transmission, fibre optic transmission, digital recording and computer monitoring to make sure you are as secure as possible. We understand there isn't a 'one size fits all' solution to security, so we will work with you to ensure we have taken all your requirements into consideration when advising you on your CCTV system. If you have any questions about our CCTV maintenance service or any of the other services feel free to get in touch. Our expert team is happy to help you with your query so contact us today.